Last year we planned a fabulous trip eating our way around Italy for Ash’s 30th birthday. Ash has a strong relationship with pizza and pasta and if left to his own devices, he would apparently eat pizza for every meal of the day for the rest of his life. Our plans came to an abrupt halt when we found out that, to our surprise, I was almost 5 months pregnant. We quietly packed our ‘Italy’ Lonely Planet guide away and nothing further was said about it. 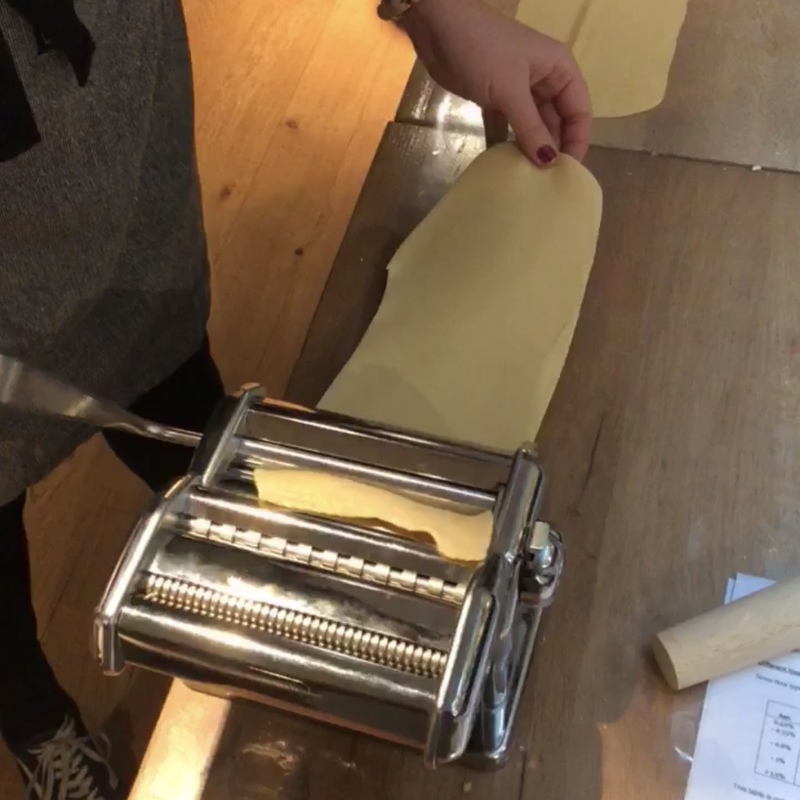 We were therefore very excited to be invited to a Flour Will Fly pasta making masterclass recently. The masterclass was held in a quiet fairy light laden corner of Olive restaurant on Castle Street. It was the perfect setting for our lesson on tagliatelle and ravioli making with Paola, the mastermind behind Flour Will Fly. There were approximately 10 of us in attendance. Some couples, some people on their own, mother/daughter duos…it was clear that learning how to make your own pasta is something which appeals to everyone. We started with the dough, kneading it to a perfect consistency which took a lot more time and effort than we had thought. Whilst we left the dough to prove we were offered a drink…for what may be the first time ever, we passed on the Prosecco! We were both a touch delicate from the night before, but they were more than accommodating and gave us some sparkling water and coffee to help nurse our hangovers. We then went on to turn our dough into tagliatelle and ravioli. At the end of the class Paolo provided everyone with a small hand written thank you card which had instructions for cooking your pasta and the best sauces/flavours to go with the different pastas we had made. Once we were done we made our way home excited to try what we had made. We couldn’t even wait until the evening to cook the ravioli and decided to go with Paola’s recommendation of a sage and butter sauce with some flaked salt to season. The pasta was so tasty (even if we do say so ourselves) and the spinach and ricotta filling, provided by Paola, was perfection. We actually now have a couple of piping bags full of Paola's spinach and ricotta filling in our freezer as there was some to spare – win! We honestly couldn’t recommend Paolo’s class enough. Paolo and her family, who assisted her, were warm, charming and full of knowledge. We enjoyed the class so much, we have already pulled out our never before used pasta maker to practice our new found skills. More information and details for upcoming classes can be found on the ‘Flour Will Fly’ Instagram page here. To book onto their next lesson (which would be a perfect stocking filling), you can either choose a date or buy gift vouchers here. © Veggie Liverpool | All rights reserved.